Movie reviews make for great TOEFL Reading practice. They deal with fun subjects that you can buy into and enjoy and they have a high level of vocabulary. Movie review vocabulary can be surprisingly academic, more than you’d expect in entertainment news. 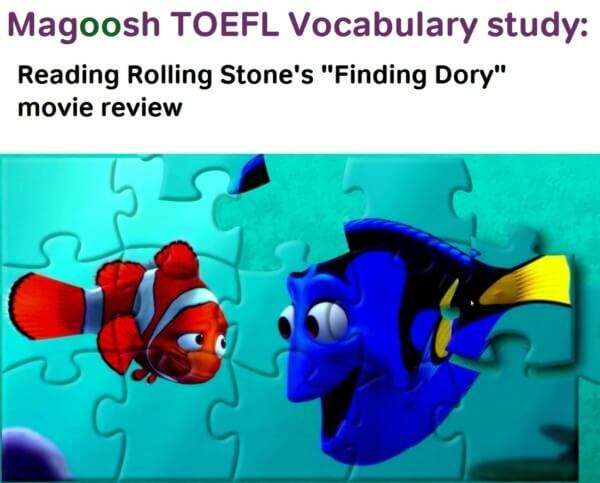 In this post, we’ll start a TOEFL vocabulary study of Rolling Stone’s review of the Disney/Pixar animated movie “Finding Dory.” The review is fairly short (you can read it at the link in the previous sentence), but it contains a lot of TOEFL-like vocabulary words! In fact, this review is so “vocabulary-rich” that we’ll organize them in this post by the paragraph they appear in. Enjoy! “Classic” refers to a work of art that people agree is very good, important, and valuable. In its common use, the word “classic” refers to old works of art that have gained respect over time. “Classical music,” for instance, would be music composed hundreds of years ago by master musicians such as Mozart, Beethoven, and Bach. Shakespeare wrote classic plays. “The Wizard of Oz,” made in 1939, is a classic American movie. By calling “Finding Dory” an “instant-classic,” Travers is saying that the movie is so wonderful that its greatness and value can be recognized by people right now, instead of slowly growing over many years. Two or more things are “reunited” if they were taken apart from each other, but are now being put back together. This word has several different possible uses on the TOEFL. History lectures and readings on the test may talk about a divided country reuniting (such as East and West Germany reuniting in 1990). History texts and lectures might also talk about two historically important people–such as explorers or traveling world leaders–reuniting at different times for meetings. “And in TOEFL biology, an animal may “reunite” with its natural habitat after being in captivity. And in chemistry, two substances that were separated might be mixed back together, reuniting. In Rolling Stone’s review of “Finding Dory,” voice actress Ellen Degeneres is described as “immortally” playing the cartoon fish Dory. This, of course, doesn’t mean that Ms. Degeneres will live forever. Instead, the reviewer is saying that Degeneres’s performance is so good that movie watchers will always remember it. The literal definition of “undertow” is a strong flow of water–a current of water–that moves underneath the surface of an ocean, lake or river. You might see this literal use of undertow in TOEFL lectures or passages about bodies of water. In the movie review, undertow is not being used literally. When the author says the movie has “an undertow of genuine feeling,” the author is saying that there are some very real emotions in the movie, but that this deep emotion isn’t the most obvious part of the movie. The serious, emotional parts of the movie are an undertow, or something strong that is under the figurative “surface” of the movie’s cute, funny appearance. In this movie review, “genuine” emotion just means emotion that is very real. The reviewer is saying that the actors are talented and make the feelings in their cartoon voices sound real. The phrase “genuine feeling” also suggests that the emotional interactions in the movie feel real for the people who watch the movie because of good writing, good animation, and good acting. On the TOEFL, “genuine” is usually used in texts and lectures about art and literature. The word can be used in the same way as it’s used in the review. A TOEFL lecturer or writer might talk about a “genuine” aspect of a classic story or play. On the TOEFL “genuine” can also refer to the real work of an artist. For instance, a genuine painting by Leonard da Vinci might be compared to a fake painting that imitates da Vinci’s style, but was created by another artist. A plague is a disease that spreads across a population of living things and kills a lot of the population. On the TOEFL, “plague” will be used literally to describe illness and its impact on groups of people or ecosystems. In this review of “Finding Dory” by Peter Travers, the word is being used figuratively. When Travers says that Dory is “plagued” by short term memory loss, he’s saying Dory’s inability to remember things is like a physical disease that makes her weak. “Disability” refers to physical or mental problems that people can have. A problem becomes a disability when the problem is serious enough that it prevents a person from doing other things that most normal people can do. On the TOEFL, the word “disability” might describe the inability to walk, hear, or see. In the movie review, Dory’s memory loss is described as a disability. “Courageous” means “brave.” It’s used to describe the personality of someone who works very hard, and is willing to do things that are difficult and scary. This word may come up on the TOEFL in history passages and lectures. This is because TOEFL history passages and lectures will often focus on one famous historical figure, usually someone who did great things. An institute is a place where people study or do research. The movie review describes a “marine institute” where sea animals like the characters in the movie are caught and studied by scientists. The word “institute” often comes up in TOEFL audio tracks that deal with campus life and contain school life vocabulary. When the movie review says that Ed O’Neill’s voice acting is “pricelessly funny and touching,” it means that O’Neill’s acting is very good–so good that it would be impossible to replace the acting with anyone else’s voice. A tentacle is a body part that’s found on certain sea animals. Tentacles are long, moving body parts that some aquatic animals use to push themselves through water, hold onto things, or grab food. An octopus normally has eight tentacles. But, as the movie review points out, the octopus character in “Finding Dory” (named Hank) lost one of his tentacles and only has seven tentacles. “Predecessor” usually refers to a person who held an official position in the past immediately before the next person took power. For example, in the United States presidency, George W. Bush was the predecessor to Barack Obama, and Bill Clinton was the predecessor to George W. Bush. You may see this word in history passages and lectures on the TOEFL. In the movie review, “predecessor” refers to a previous movie in a series instead of a previous person in an official job. This is a less common use of predecessor. But you’ll often see this in movie and book reviews; an earlier part of a series of stories or literary works can be called a predecessor to the later parts of the series. “Brim” is a verb that literally means “to overflow.” If something brims, it becomes so full that things begin to fall out of it. On the TOEFL, you might hear about an ocean or river brimming in a storm or flood, as that water levels rise. TOEFL writing and speech may also describe a series of events or a story as “brimming with excitement,” meaning it is really full of excitement. This figurative use of the verb “brim” also appears in Rolling Stone’s review of “Finding Dory.” Reviewer Peter Travers concludes his movie review by saying that this new Disney/Pixar movie “brims with humor,” meaning that it’s very funny. Movie reviews always stretch your English ability and give you chances to build your vocabulary. In this series of posts, I focused only on the words in the review that were TOEFL-like. But this critique of “Finding Dory” has quite a few idioms and slang words, as well as a few other academic words I didn’t include in our study. If you still see other words and phrases you’re not sure about, try to guess their meaning through context. Then check your guesses on an English learner’s dictionary such as Wordnik or Vocabulary.com.